It's always exciting when we get a rare, in-depth look at a professional-use product designed for the B-to-B market. But as it happens, the broadcast lens highlighted in this installment is a somewhat familiar product—almost every day, we view programming captured with such lenses. 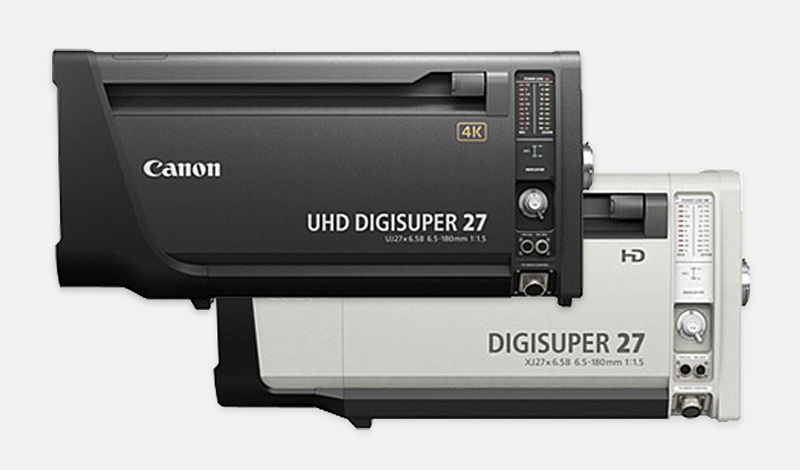 To accommodate the broadcasting industry as it shifts from HD to 4K (UHD), Canon developed the UHD-DIGISUPER 27, a studio zoom lens for 4K broadcasting that achieves the same size and ease-of-use as an HD lens. Broadcast lenses are generally classified into three types: studio zoom lenses, used mainly in the broadcasting studio; field zoom lenses, used for relay broadcasting of sports and other live events; and ENG/EFP lenses, used for production of such TV programs as news and on-location events. Broadcast lenses provide high-definition 4K/HD images free from geometrical distortion and color blurring through the use of such optical elements as fluorite and aspherical lenses. Several dozen lenses are optimally configured, resulting in a broadcast lens capable of meeting the high standards of optical performance demanded by professional video production. For greater ease of use, some lenses are also equipped with high-precision position-detecting elements (encoders) and control circuits to realize superior operability. 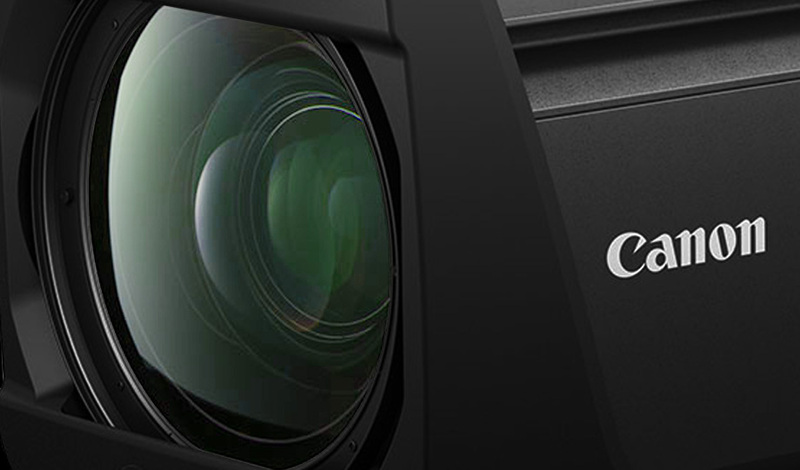 What is Canon's vision for the growing 4K market? 4K (3840 x 2160 pixels) technology produces highly detailed images with a resolution 4 times greater than that of HD (1920 x 1080 pixels). Distribution of 4K content has already begun, and consumer-level 4K televisions are becoming more affordable and as a result, more popular. What's more, 4K television broadcasting is slated to commence in fall 2018. In anticipation of this advancement, 4K video production equipment has shown rapid progress in the broadcasting industry worldwide. Faced with this global trend, how did the broadcast lens development team react? 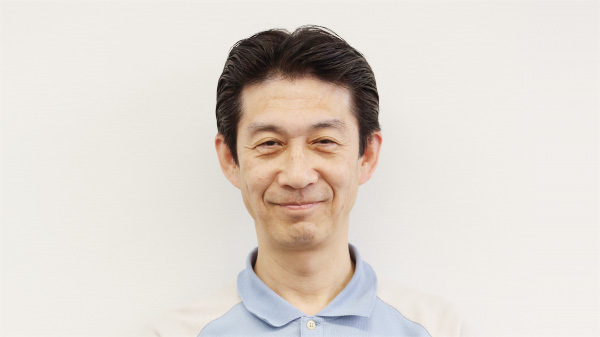 Mr. Nakamura has been actively engaged in the development of broadcasting equipment (especially portable lenses, large lenses, and cinema lenses for broadcasting) since he joined the company in 1986. His motto: "Enjoy your work and treasure your family." In the fall of 2018, 4K and 8K satellite broadcasting will commence in Japan. How is the broadcasting industry preparing for the shift to 4K? The shift to terrestrial digital broadcasting started around 2003 in Japan. 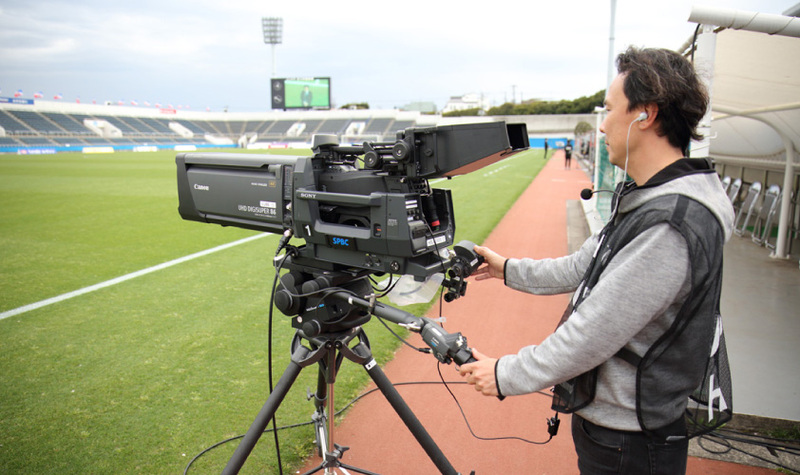 Among broadcasting networks and production companies that had adopted HD equipment at the time, demand for replacement equipment will likely emerge in 2017. When they purchase this equipment, they'll need lenses and other 4K-capable technologies that achieve even higher performance. Currently in Japan, there's a high demand for 4K equipment, while demand for HD equipment is declining. As for terrestrial broadcasting in the U.S., the industry is somewhat less eager to promote 4K. However, looking to internet-based video distribution services, the shift to 4K is showing steady growth. In Europe as well, 4K equipment is being actively introduced, with the primary targets being sports networks offering soccer and the like. Meanwhile, in emerging countries, digital broadcasting is only just starting. So they plan to introduce the most advanced 4K equipment first, as is the case with advanced countries, essentially leapfrogging HD equipment. The global 4K market is really heating up, isn't it? However, we cannot expect to sell 4K equipment if it is inferior to HD equipment in terms of size, weight and ease of use. The same goes for the price, too. So for the UHD-DIGISUPER 27, a studio zoom lens for 4K broadcasting, we sought to match the DIGISUPER 27 HD in terms of those same points. 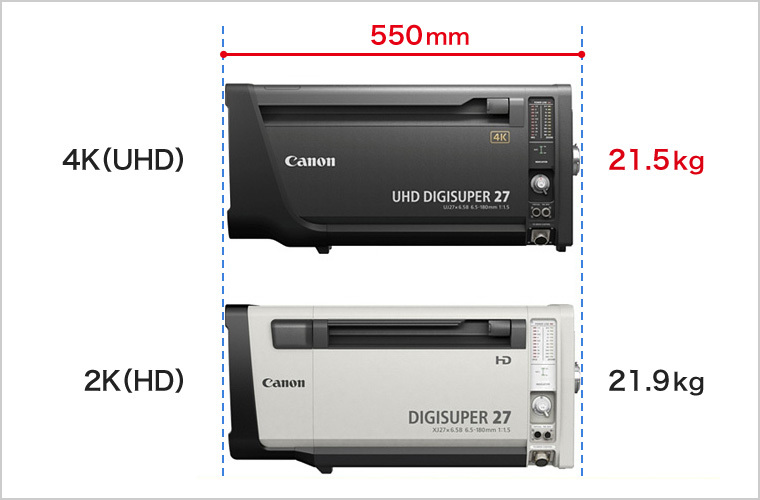 How did you formulate your plans for the UHD-DIGISUPER 27? We started by asking questions like, "What exactly does 4K represent in a studio zoom lens?" or "Are conventional evaluation devices and assembly processes still adequate?" From there, our ideas began to take shape. 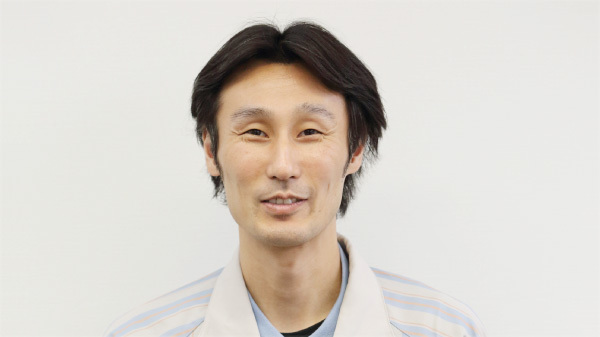 As it happened, the individual divisions closely involved in developing, evaluating and manufacturing broadcasting lenses were all concentrated together in the Utsunomiya area. Taking advantage of this, we were able to effectively collaborate from the initial stages to determine the lens' specifications. 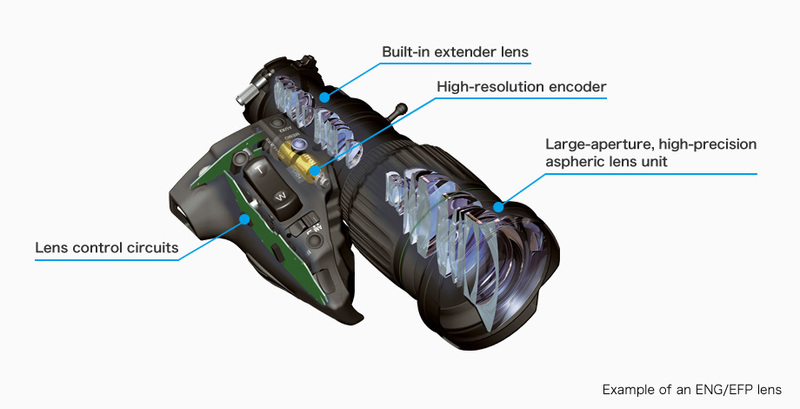 The UHD-DIGISUPER 86, a field zoom lens commonly used for 4K soccer broadcasts. 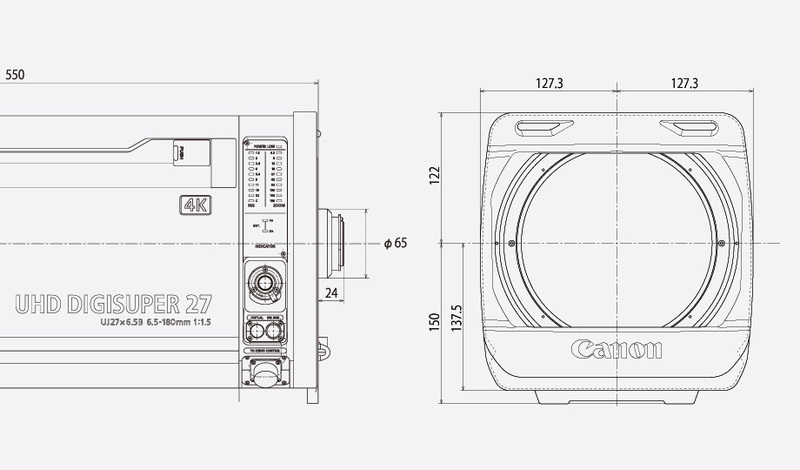 Canon launched the DIGISUPER 27, a 27x HD studio zoom lens, a full decade ago in 2007. We received a lot of positive feedback from users, who praised its high resolution and focusing capabilities. Since this new lens would be its 4K successor, user expectations were naturally quite high. We were very much aware of its imaging performance, that is, its superior 4K resolution and color reproduction. 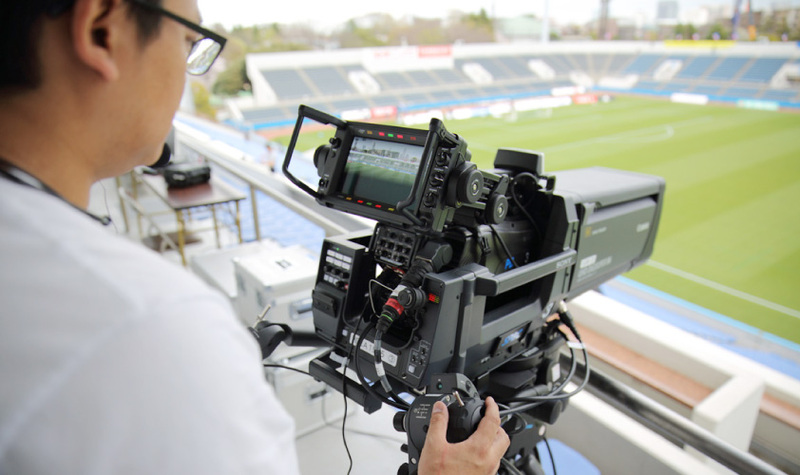 And while we knew that the UHD-DIGISUPER 86, which provides higher magnification, is used for relay broadcasting of such outdoor sports as soccer and golf, we also learned that studio zoom lenses are used frequently for relay broadcasting of sports, including soccer in Europe and golf in Japan. We kept that in mind when developing the UHD-DIGISUPER 27. We identified our technical targets by investigating the level of 4K performance that can be achieved with current technologies, what those technologies lack and what is needed for users to transition smoothly from an HD environment to a 4K environment. For example, conventional zoom lenses are equipped with a mechanism for adjusting the flange focal length*1. For 4K models, any image distortion arising from this adjustment must be minimized. So, we tackled problems like this one by one. Reimagining the optical structure from scratch! With our newly developed 4K studio zoom lens, we sought to match the size and ease-of-use of a HD lens while ensuring optimal imaging performance for 4K. The optical design team reviewed the structure and materials used in the lens from the initial design stages and conducted repeated trial-and-error development while gathering team members' opinions. 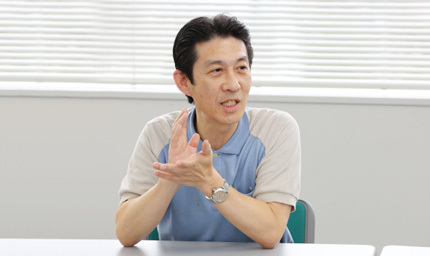 Mr. Hori joined the company in 2001. He gained experience in the development of broadcasting equipment (portable lenses, large lenses, cinema lenses, SHV for broadcasting). In pursuit of an optical design that ensures a project's success, he emphasizes the designer's inspiration as well as close communication with users and the production site. Is there a considerable difference in optical design between HD and 4K? The pixel pitch of a 4K image is about half that of an HD image, and so the need to minimize chromatic aberration is higher as well. For example, we reviewed some design goals in order to reduce chromatic aberration due to magnification that results in color blurring on the periphery of the screen. 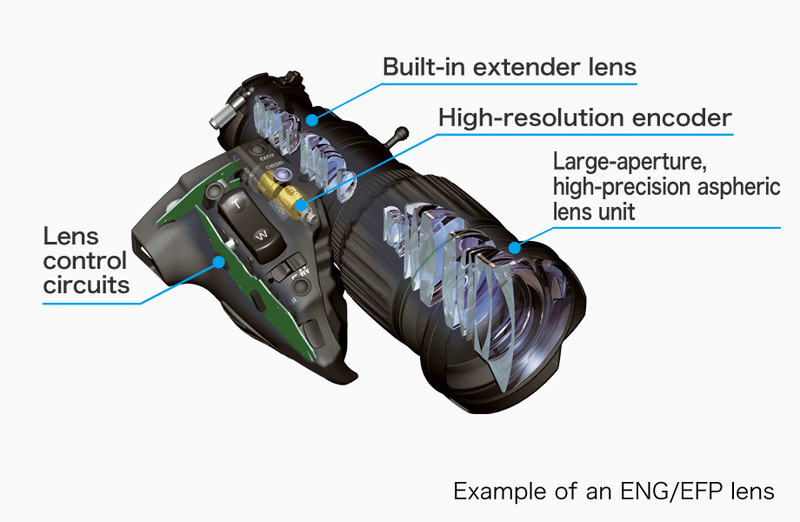 To meet these goals and fulfill users' needs with a lens the same size as our HD lens, we needed to change the lens configuration significantly. 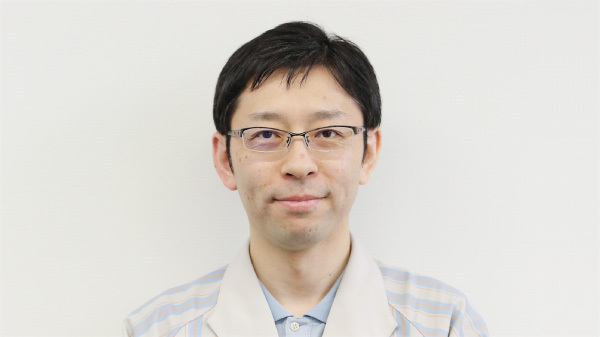 Furthermore, over the ten-year development interval, we witnessed considerable advances in terms of design simulation, optical characteristics of lens glass, and camera functions. We took a proactive approach to these changes and built an optical design environment that is ideal for 4K-compatible products. How did the design and development processes proceed? First, the optical designer creates a rough design of the lens shape and layout with a CAD system. This design is shared with the mechanical designer, electrical designer and the person in charge of manufacturing. They discuss how the lenses should move, and which parts are to be used for adjustment. We were often saying to each other, "this physical restriction is making things difficult, I wonder if they can do something about it in optical design." As lenses shift to 4K and high-resolution technologies, the moving lens group*2becomes heavier. As a result, the moving lens group doesn't move as intended, or doesn't stop at the intended positions, when the camera is tilted upward or downward. It is also important to ensure that the lenses will function normally in both high- and low-temperature environments. The optical designer assumes responsibility for the design, the mechanical designer conducts simulations, and the electrical designer verifies that the lenses move as intended under the expected conditions. Test results are then fed back to the optical designer and mechanical designer. Does the person in charge of manufacturing participate in the very early stages of development? Definitely. They might, for example, request an adjustment mechanism, or ask "can you be a bit more lenient with the accuracy required of this part?" In discussions with those in charge of manufacturing and evaluation, we would exchange opinions and the designers would modify the design if any issues arise. After the individuals in charge determine the probability of achieving the quality goals, these targets are specified in design drawings, which form the basis for the prototyping phase. Actually, after that, a long process gets under way. Once a prototype is created, it must undergo evaluation testing to determine whether the design performance and reliability have been achieved. If no problems arise, we proceed to the manufacturing phase. Joined the company in 1998. 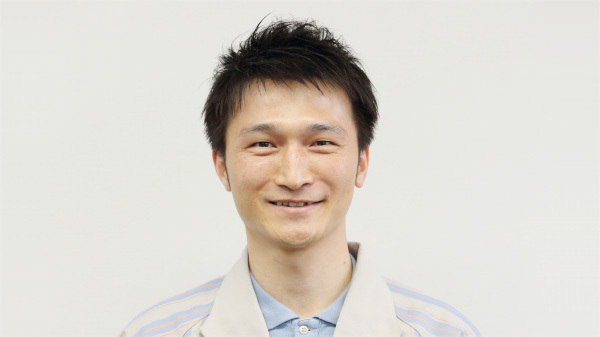 After gaining experience in the development of elemental technologies for photovoltaic systems and the like, Mr. Suzui became involved in the development of broadcasting equipment (portable lenses, large lenses, cinema lenses, and SHV for broadcasting). 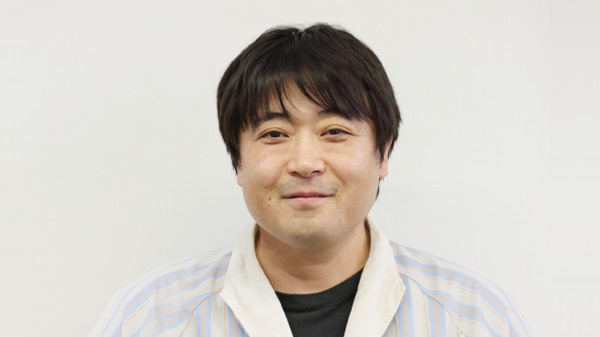 He has gained experience in many areas including evaluation, factory operations, sales company operations and user support. 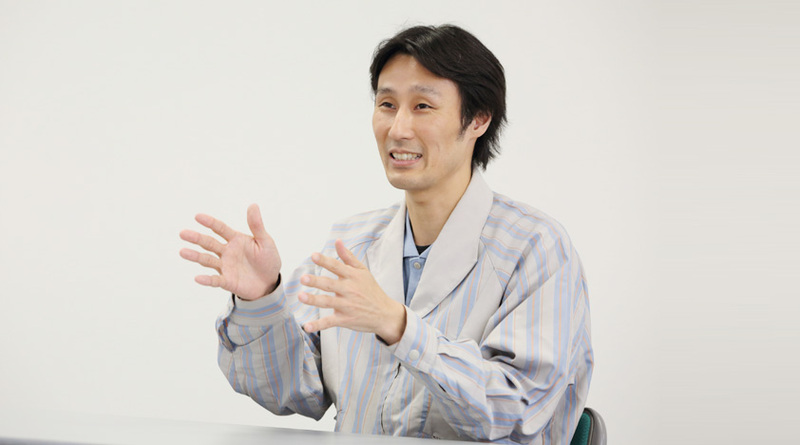 His motto is, "Communicate with simple expressions." As you can see from this interview, there is no clever way of developing this kind of broadcasting equipment. There is no set pattern whereby a product can be created by simply by saying "Yes" or "No" at different steps. Of course, we use tools like simulation software, but we have learned from experience that we cannot complete a product without discussing it with the people in charge of optical design, mechanical design, electrical design, evaluation and manufacturing. The designers support assembly processes in the factory. Lens prototyping must be quite costly. Each piece of glass in a large broadcasting lens is about 20 cm in diameter. So, as you can imagine, the prototyping process is very costly. That's why the people in charge of evaluation and manufacturing should participate in the initial design during the development stage. Multiple perspectives help to reveal any problems. A single screw makes all the difference! Bringing out the maximum optical performance of a 4K system requires that the mechanism which moves the lens be far more precise than that of conventional equipment. Even the way a screw is fastened can significantly alter performance. The heads of design and manufacturing discussed ways to find optimal solutions. 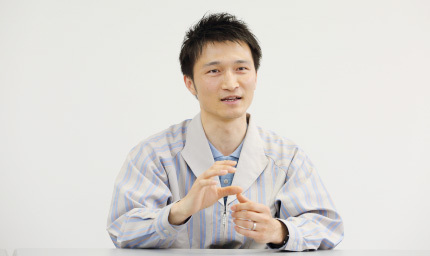 After joining the company in 2005, Mr. Kuwano helped develop portable lenses and cinema lenses for broadcasting applications. 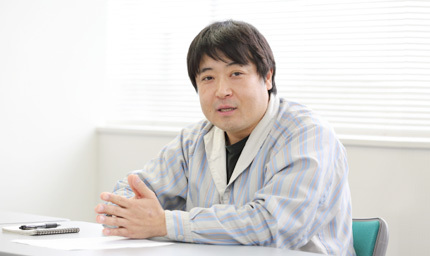 In 2012, he was assigned to his current position focused on the development of large broadcasting lenses. His policy is to visit the manufacturing site, see the actual product and experience the situation firsthand. What are the key issues for mechanical design? Variations are inevitable at the manufacturing stage. Trying to minimize this, while also realizing the capabilities put forward by the optical designer, proved to be quite a challenge. For example, there are many factors to be considered regarding the way lenses are held in place, such as the orientation and position of the lens being held. If the moving lens group rattles to an extent that exceeds the tolerance level, we must come up with a method of suppressing the rattling and obtaining a satisfactory level of accuracy, which we can achieve through such means as improving parts accuracy, changing the mechanical structure or correction during the assembly process. We face considerable difficulties when deciding how to achieve satisfactory precision. We even ask the head of assembly if the issue can be solved during the assembly process. If that's not possible, we rethink our original design. Do you use simulation software when making such decisions? Some issues just can't be solved through simulation alone. In such cases, we might make a simple one-off prototype of the mechanism in question. If a lens is tightened excessively, it will become deformed and affect the projected image. If a very thick lens is tightened only slightly, it doesn't cause a problem. However, with a 4K lens, the effects of lens deformation are far more severe than with an HD lens. So, as you can see, even the lens tightening force must be precisely specified. Broadly speaking, the design phase is divided into optical, mechanical and electrical design. Actually, the work of the mechanical engineer seems to be the most challenging of the three [laughs]. The optical designer asks them to ensure the lens unit is held securely so that the lens consistently exhibits the specified design performance, while the electrical designer requests a reduction in weight so that the lens operates normally in all conditions. On top of all this, the mechanical designer also has to consider the manufacturing process. Compared with other lens products, a broadcasting zoom lens requires much closer cooperation between the development and manufacturing teams. Even after mass production starts, the designers might hold discussions with the plant's assembly division. Is that because of the stringent requirement for accuracy? Absolutely. It's just not possible to achieve the required level of performance by focusing solely on the precision of a single component or lens surface. Adjustments by assembly workers are indispensable. If the manufacturing section requests an improvement in the assembly or adjustment processes, we visit the assembly site and hold discussions to hear the opinions of workers in the field. Otherwise, the problems will persist with the next product and the product after that, and so on. 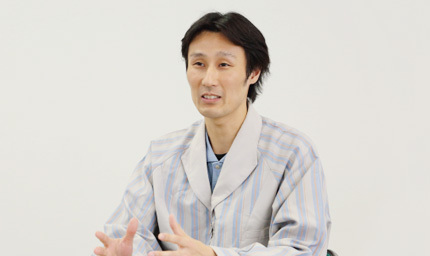 Mr. Kawaguchi joined the company in 2004. Since then, he's primarily been involved in product development for broadcasting lenses. He strives to think and act swiftly in his mission to ensure conformance with quality, cost and schedule requirements. What manufacturing difficulties did you encounter when developing this product? Focus shift during zooming proved to be particularly difficult. With a still camera, no problems arise if the camera is brought into focus at the zoom position. However, a video camera needs to remain in focus even in the middle of a zoom operation. With the shift to 4K, the level of accuracy demanded of such operations has become even more stringent. For example, the lens has an adjustment mechanism that enables lens interval adjustment through the use of washers. This adjustment is extremely challenging. And as the required level of accuracy increases, finer adjustments are required. If we face problems related to decreasing operability or difficulty in adjustment, we may talk to the development team and ask them to alter the configuration. Performance evaluation of a 4K lens seems much more demanding than that of an HD lens. In order to reduce the lens surface accuracy error*3by half, we maintain strict accuracy control by implementing new high-resolution measuring instruments. What's more, it was requested that for this zoom lens, we achieve twice the resolution and color reproducibility of an HD lens. So, we've adopted higher standards for evaluations and controls to ensure the lens meets the requirements of a 4K-compatible product. Simply projecting finely detailed images isn't enough for a broadcasting zoom lens; image contrast is also essential, as are measures to reduce ghosting and flare*4. 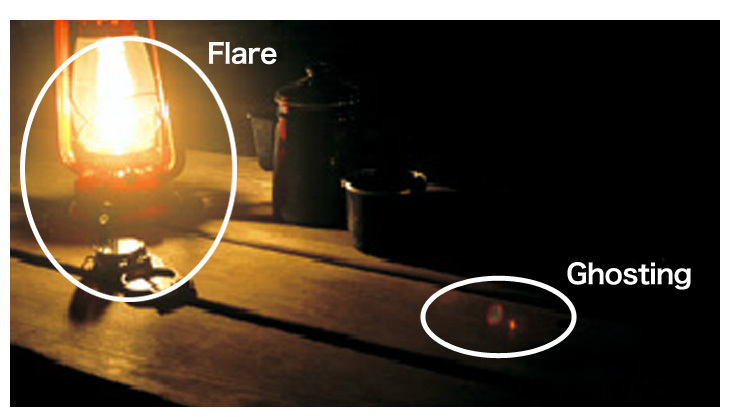 Phenomena in which a projected image is duplicated due to internal lens reflection (ghosting) and light appears to project from behind the target (flare). What pushes developers to change the future of visual expression? 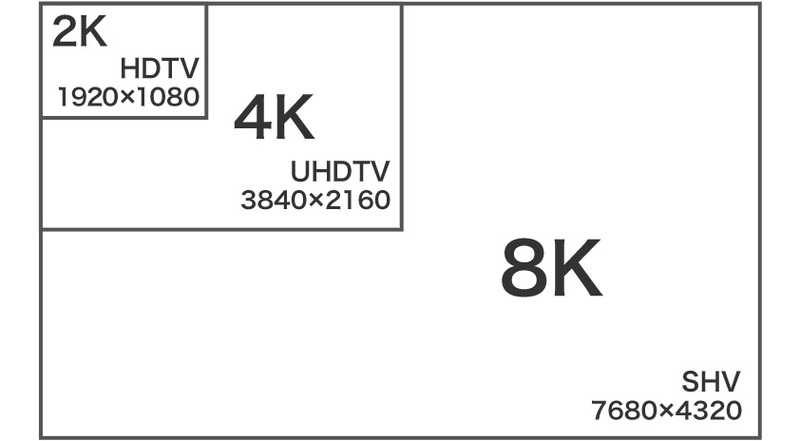 Professional broadcasting equipment: the shift toward high-resolution 4K and 8K products. What kind of equipment is demanded in the field? The entire broadcasting lens team, from development to manufacturing, monitors users' needs to achieve the utmost usability. 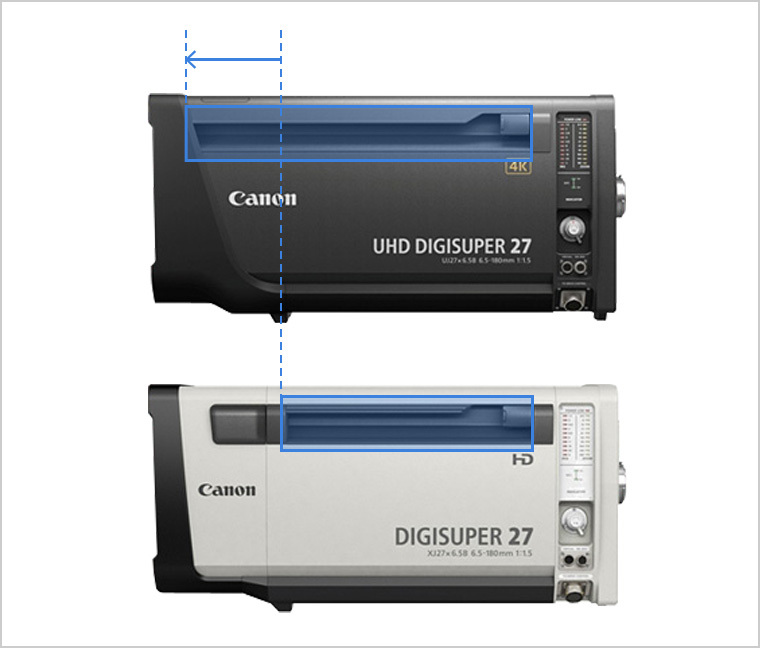 One of the sales points of the UHD-DIGISUPER 27 is that it is as easy to use as an HD lens. In light of this point, how did you develop the product? Well, with the UHD-DIGISUPER 86, which was launched before the UHD-DIGISUPER 27, the center of gravity is offset slightly forward compared with a conventional HD lens. This was done to improve the optical characteristics. So the handles ware extended forward, making it longer than that of the previous model. The UHD-DIGISUPER 86 is designed to be carried with greater stability, so we also reviewed the internal structure. 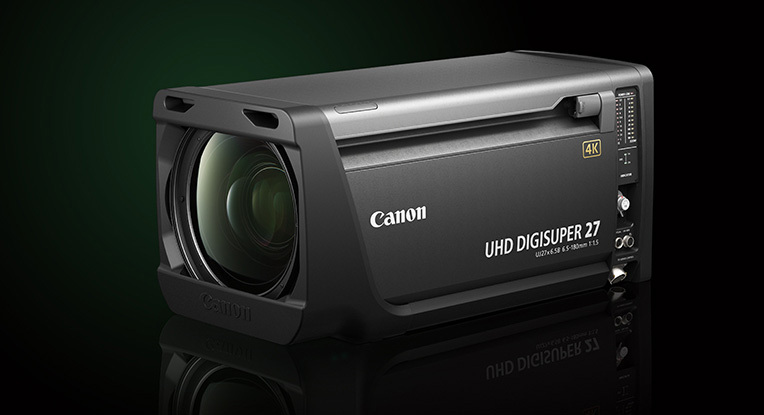 In keeping with this design concept, the UHD-DIGISUPER 27 provides even greater mobility than the DIGISUPER 27 HD lens, and with its reduced mass you can expect greater maneuverability. What's more, its compatibility with the electronic system means users can continue using their accessories to the same effect as when used with a HD lens. Such design improvements can be seen in several other areas as well. Staff in the field, for example, were persistent in requesting a shorter body and wider angle. I wondered why the size of the unit was an issue for large TV networks, but once I actually made a site visit, I saw that most TV studios, even those at major TV networks, are somewhat limited in size. Real-world circumstances that prevent a camera operator from moving back beyond a certain point were reflected in the final specifications. We designed the product to meet the requests of TV networks and those providing programming content. For example, we provided angled switches and more intuitive operation. Some of these tasks were quite difficult to achieve, but once I saw the reasons behind these requests, I realized how we as designers communicate with camera operators through our technology. What features will be necessary for broadcast lenses in the future? In today's broadcasting market, both HDR*5and BT.2020*6color gamut extension technology are already being adopted, and at the same time the trend of moving toward 4K/8K high-definition systems is also taking off. So, we are seeing demand for the utmost enhanced resolution and color reproducibility from zoom lenses. With the growing trend toward high-definition camera sensors, we are addressing imaging performance while taking the influence of diffraction*7into consideration. We are also seeing demand for further reductions in zoom lens size and weight to accommodate reductions in the size of the camera body. We consider it necessary to introduce products that exhibit high imaging performance and usability on a timely basis in order to meet this growing market demand. As for the recent shift from HD to 4K, our users are most concerned about focusing. If a camera goes out of focus even a little, it is directly expressed as blurring on a large screen. For example, we believe that it will be necessary to improve the operability of the controller and introduce AF-like functions. 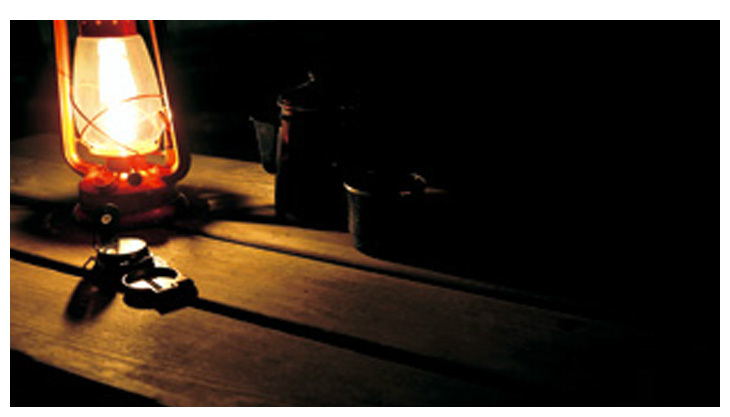 High Dynamic Range: a technology that expands the dynamic range of the image. A UHDTV color gamut standard introduced in August 2012 that is capable of reproducing approximately 99.9% of the colors that exist in nature. If a wave of light or sound is blocked by an obstacle in its path, it is reflected behind the obstacle. This phenomenon is called diffraction. In photography, light reflected to the back of the diaphragm will not reach the image pickup device, resulting in a blurred, low-resolution image. The viewfinders for broadcast cameras are not something we produce. In the future, however, I think we should also consider a method that enables users to check focus using the viewfinder and controller. For a 4K or 8K image, the user cannot determine whether an image is in focus merely by looking through the roughly 7-inch viewfinder. When shooting outdoors, for example, it can be a major problem to find out that the image is blurred when checking it later on a large-screen monitor. So for the future we have to think about how our technology can help solve this. For lenses used in broadcasting, users' requirements can be very high. What kinds of requests are submitted to engineers involved in lens manufacturing? In the development field, engineers commonly have access to 3D CAD and simulation tools. But we can seldom solve problems using such virtual tools alone. If we lose our familiarity with seeing and touching real components, we are likely to encounter difficulties afterwards. Fortunately, the factory located on the Utsunomiya site enables us see and work with actual components. Of course, engineers also have to be able to work quickly. I specialized in mechanical design at university. But without knowledge of optical design and other kinds of design, I would be unable to cope with unexpected situations. I think people who are interested in a wide range of fields make good engineers. I think in the future optical designers need to understand they are forging new means of visual expression with the products they are developing and rise to that challenge. The UHD-DIGISUPER 27 was challenging in terms of achieving both its specs and levels of performance, but our user-first approach has been highly rated, and I personally watch a lot of TV and movies, so I am very proud of this 4K product that was built on the technologies developed by our predecessors and came to fruition with the help of everyone around us. In the B-to-B segment, it is important that developers build direct relationships of trust with our customers, and that they empathize with the customer. A camera operator at a TV network once asked me to provide a zoom that "accelerated with a sensation like stepping on the accelerator of an imported car." In response, I actually rented a model of the specific imported car he was referring to in order to experience its acceleration. When I later told him about this, he smiled and said that my approach was unique. At the time, I'd felt that the camera operator had at least appreciated my attempt to understand and accommodate his request. It is extremely difficult to grasp and quantify such an ambiguous, subjective request. However, after establishing a relationship of trust with him, I got some very specific feedback and eventually managed to develop a suitable product. Although quantifiable technologies can be imitated, a relationship of trust that has been nurtured over a longer period or through shared experiences cannot be easily imitated. I always feel that this is an essential aspect of the B-to-B approach, which is a part of what is demanded of developers like us. Recently, with the emergence of virtual tools and smartphones, the number of people who prefer to do things alone seems to be increasing. However, a single worker can develop almost nothing alone. Communicating and collaborating with others is essential. One must talk with others in the field and not simply accept information obtained directly from the Internet at face value. Communicating with a variety of people enables one to absorb interesting information. I also think people should experience at least one setback. I wish engineers would exhibit such vitality when struggling to develop a product. Actually, developing products that require extremely high accuracy is a very analog process. When we see a beautiful image, naturally we think "isn't it beautiful?" But how would one define "beautiful?" From standard definition to HD, and from HD to 4K and even 8K, we are seeing images with even higher resolution that are close to looking real. But, in the end its our brains that tell us what "beauty" and "real" are. Developing a product that satisfies such ambiguous, opaque sensibilities requires that we repeatedly and earnestly communicate with users to achieve gradual progress while building a consensus among those in charge of development. To develop a product that is competitive at a global level, teamwork is just as important as advanced technologies. 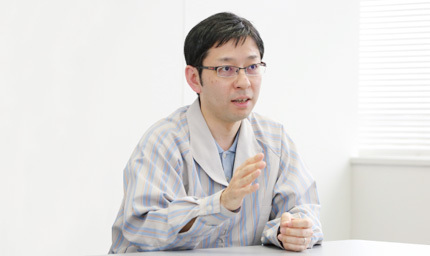 Teamwork might be the biggest advantage for Japanese companies when competing in global markets.